Normally shortcuts are used to reduce time of any activity. 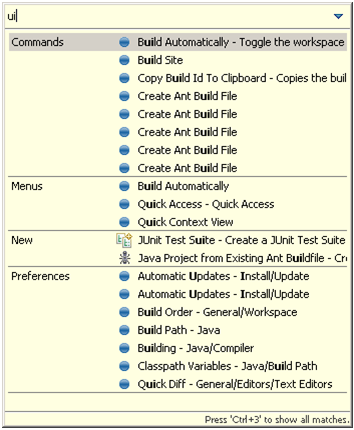 There are lot of shortcuts for the Eclipse IDE which are not generally aware to the developer. Below we are listing important shortcuts for Eclipse EDE. Eclipse IDE provides lot of short cut. There is a master shotcut which opens a dialog box. Any command can be typed in that and it helps to get all the detail realted to the keyword typed. Eclipse provides keyboard shortcuts for the most common actions. Using shortcuts is usually preferable as you can perform actions much faster. For eg; Here on typing CTL+3 , it opened up the dialog box and further typing ‘ui’ in the dialog box, it listed all the possible commands, menus ,preference, perspectives etc. Here wildcard search is also possible and it returns all possible output. The below listed shortcuts can be used while doing coding in Eclipse IDE. The below listed shortcuts help you in navigation in Eclipse. The below listed shortcuts helps in performing Search operation in Eclipse IDE. The below listed shortcuts helps to Run programs in Eclipse IDE. The below listed shortcuts helps in handling the Editor of Eclipse IDE. CTRL + O – Show all methods of the current class, press CTRL + O again to show the inherited methods. F12 – Focuses on the editor (especially helpful if you work with Fast Views). CTRL + Shift + O – Organize the imports; will import the missing import statements. CTRL + Q – Go to position the cursor at the last changed position in the editor. The below listed shortcuts using Arrow keys help to perform the listed operations in Eclipse IDE. The below listed shortcuts using the listed keys help to perform various delete operations in Eclipse IDE. The below listed shortcuts helps to do the variable assignment. The below listed shortcuts helps to perform refactoring.